The two species of Gallinule which occur in the United States are confined within a comparatively small range in that extensive country, the southern portions of which appear to suit them better, at all seasons of the year, than the other districts. The Common Gallinule is extremely abundant during winter along the rivers, fresh-water creeks, lagoons, ponds and lakes between the Gulf of Mexico and the eastern shores of the Floridas, while in spring and summer a good number migrate eastward into the Carolinas, and now and then a few stragglers may be seen on the fresh waters of the Middle Districts, beyond which none, to my knowledge, have ever been observed. They seldom ascend any of our southern streams to any considerable distance, few are ever met with many miles above Natchez on the Mississippi, and none are to be seen in the Western Country. In general they are equally diurnal and nocturnal in their habits, and when undisturbed frequent the land as much as the water. In the lower parts of Louisiana and the Floridas, I have seen them seek their food and amuse themselves by day in the pastures and fields, and I have observed both them and the Gallinules of England enacting their courtship, while the sun was yet high above the horizon. In sight of man, however, they are timorous, although not shy, and retreat from him among the grass and sedges bordering the water, to which they resort for safety. If shot at, or otherwise frightened, they run with speed, and either fly or swim off as fast as possible, to elude their enemy. During my various temporary residences in London, I have often seen the Gallinules resort to the grounds in the Regent's Park at all hours of the day. They were there in a manner partially domesticated, and walked quite unconcernedly in the meadows, led their young over the water, and paid their addresses to each other, while fifty or more persons were amusing themselves with feeding the ducks and swans over the bridge leading to the inner circle, and within sight of these birds. While I was at Spring Garden Springs in East Florida, in the early part of January, the Gallinules were seen in great numbers on every bayou leading towards the waters of the St. John, and at that early period the manifestations of their amatory propensity were quite remarkable. The male birds courted the females, both on the land and on the water; they frequently spread out their tail like a fan, and moved round each other, emitting a murmuring sound for some seconds. The female would afterwards walk to the water's edge, stand in the water up to her breast, and receive the caresses of the male, who immediately after would strut on the water before her, jerking with rapidity his spread tail for awhile, after which they would both resume their ordinary occupations. This was in the middle of the day, when I could have counted eight or ten pairs in sight. The nest is formed with more labour than art, being composed of a quantity of withered rushes and plants, interwoven in a circular form, frequently from two to three inches thick in the centre, surrounded by an edge or brim four or five inches high. If not greatly disturbed, these birds raise several broods in a season, using the same nest, and making additions to it previous to depositing each new set of eggs. In Lower Louisiana I found it usually five or six feet from the water, among the rankest weeds, along the bayous and lakes, which are so numerous there. In some instances it was placed on a prostrate trunk of a tree over the water, when the materials of which it was composed were less abundant than in other circumstances. I never saw one floating loose, but have often heard people say they had occasionally seen a nest in that state, although I am not much disposed to give credit to such assertions. The number of eggs seldom exceeds eight or nine, and is more frequently from five to seven. As the bird lays more than once, its progeny is thus numerous. 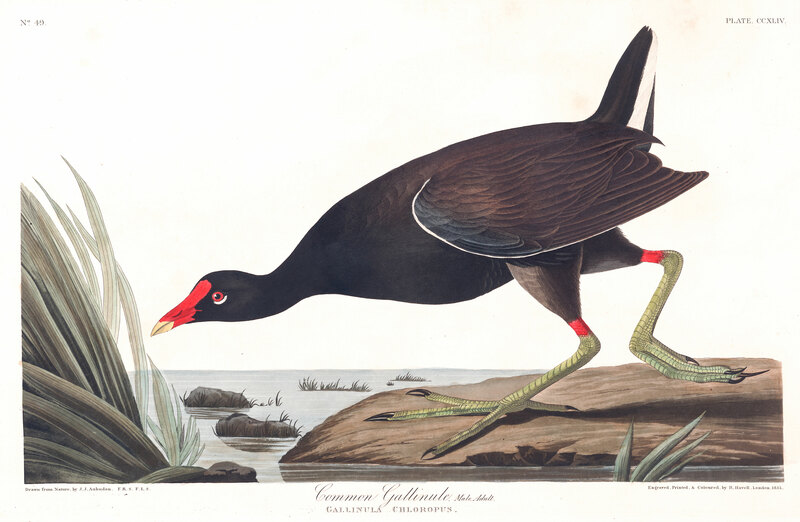 The Gallinules cover their eggs when they leave them, no doubt to protect them from Crows and other enemies, but return to them as soon as food has been procured, although both sexes incubate. The eggs measure an inch and five-eighths, by an inch and one and a half eighths, and are of a dull darkish cream colour, spotted and dotted with various tints of reddish-brown and umber. The females are as assiduous in their attentions to their young as the Wild Turkey Hens; and, although the young take to the water as soon as hatched, the mother frequently calls them ashore, when she nurses and dries them under her body and wings. In this manner she looks after them until they are nearly a month old, when she abandons them and begins to breed again. The young, which are covered with hairy, shining, black down, swim beautifully, jerking their heads forward at each movement of their feet. They seem to grow surprisingly fast, and at the age of six or seven weeks are strong, active, and perhaps as well able to elude their enemies as the old birds are. Their food consists of grasses, seeds, water-insects, worms, and snails, along with which they swallow a good deal of sand or gravel. They walk and run over the broad leaves of water-lilies as if on land, dive if necessary, and appear at times to descend into the water in search of food, although I cannot positively assert that they do so. On more than one occasion, I have seen a flock of these young birds playing on the surface of the water like Ducks, beating it with their wings, and splashing it about in a curious manner, when their gambols would attract a garfish, which at a single dart would seize one of them and disappear. The rest affrighted would run as it were with inconceivable velocity on the surface of the water, make for the shore, and there lie concealed and silent for a quarter of an hour or so. In the streams and ponds of the Floridas, this species and some others of similar habits, suffer greatly from alligators and turtles, as well as from various kinds of fish, although, on account of their prolific nature, they are yet abundant. This Gallinule seldom resorts to salt water, but at times is met with on the banks of bayous in which the water is brackish. This, however, happens only during winter. On land it walks somewhat like a chicken, and thirty, forty, or more individuals may be seen searching for worms and insects among the grass, which they also nip in the manner of the domestic fowl. On such occasions, the constantly repeated movements of their tail are rendered conspicuous by the pure white of the feathers beneath it, which, along with the white stripes on the flanks, and in spring the vivid red of the frontal plate, renders their general appearance quite interesting. In cases of danger, they run with great speed, and easily conceal themselves. On the water they sit very lightly, and swim with activity, the movements of their head and neck keeping pace with those of their feet. They pick up their food from either side, continually jerk their tail, and not unfrequently touch the water with it. Although not a migratory bird, this species flies very well, whenever it has occasion to rise from the ground. Its wings, although concave, are large for its size, more so in fact than those of Rallus crepitans, which migrates to a considerable extent. But in general, the Gallinules are averse from flying, unless when anxious to remove from one lake or stream to another, when they rise fifty or sixty feet in the air, and fly with ease and considerable velocity, by continued flappings, the neck and legs stretched out. At all other times when raised, they suffer their legs to dangle, proceed slowly to a short distance, and drop among the reeds, or, if over the water, they dive and hide, leaving nothing but the bill projecting above the surface. The young in autumn have not attained their full size; their colours are much duller than those of the old birds, particularly the stripes on the flasks and under the tail, which are of a dull cream colour instead of being pure white. The frontal plate is small, and almost covered by the feathers around it; the legs and feet are of a dingy green, and the red band on the tibia is scarcely apparent. In spring they acquire their full plumage, but the frontal plate increases in size for several years. There are great differences as to size between birds of both sexes. The male from which I drew the figure in the plate, was of an average size, having been selected from a bagful procured expressly for the purpose. GALLINULA GALEATA, Bonap. Amer. Orn., vol. iv. p. 128. FLORIDA GALLINULE,Gallinula galeata, Nutt. Man., vol. ii. p. 223. COMMON GALLINULE, Gallinula Chloropus, Aud. Orn. Biog., vol. iii. p. 330. Male, 14, 22. From Texas to South Carolina, common, and resident. Stragglers are seen as far as Massachusetts. Abundant in Louisiana and Florida. Up the Mississippi to Natchez. Fresh water. Adult Male, in spring. Bill shorter than the head, nearly straight, rather stout, deep, compressed, tapering. Upper mandible with a soft oblong plate at the base, extending over the forehead, the dorsal line beyond this plate straightish and slightly declinate as far as the middle, then arcuato-declinate, the ridge rather narrow the sides nearly perpendicular, towards the end slightly convex, the edges sharp, with a notch close upon the narrow obtuse tip. Nasal groove extending to the middle of the bill, rather broad; nostrils submedial, lateral, linear, direct, previous. Lower mandible with the angle long and narrow, the sides nearly erect, with a groove to the middle, the dorsal line beyond the angle ascending, straight, the edges sharp, inclinate, the tip narrowed, rather sharp. Head small, oblong, much compressed. Neck of moderate length, slender. Body much compressed. Feet large, long; tibia bare a considerable way above the joint; tarsus rather Ion,, strong, compressed, anteriorly covered with broad scutella, laterally with angular scales, posteriorly with minute scales; hind toe comparatively small, middle toe longest and much longer than the tarsus, fourth considerably shorter, and but little longer than the second; toes free, slender, compressed, scutellate above, flat beneath and marginate; claws rather long, slender, much compressed, acute. Plumage soft, blended, on the fore part of the head short; a tuft of elongated incurved feathers on the sides. Wings short, broad; alula large; primaries curved, broad, second and third longest, first and sixth about equal; secondaries broad and rounded. Tail short, much rounded, of twelve rather weak rounded feathers, which but slightly exceed the upper and lower coverts. Frontal plate and bill deep carmine, the ends of both mandibles yellow. Iris bright red. Feet yellowish-green, a portion of the bare part of the tibia carmine; claws dusky. Head and neck deep bluish-grey; that colour continues paler over the breast, sides and abdomen, the latter having the feathers tipped with greyish-white, and the posterior hypochondrial feathers having a longitudinal band of white towards the end; lower eyelid white, as are the lateral lower tail-coverts, those in the middle black. The back and wings are deep olive, the latter having a narrow edging of white, which also runs along the outer quill. Tail brownish-black. Length to end of tail 14 inches, to end of claws 19; extent of wings 22; wing from flexure 7 1/4; tail 3; bill from base of frontal plate 1 11/12, along the edge of lower mandible 1 1/4; tarsus 2 1/4, middle toe 2 7/12, its claw 8/12. Weight 12 oz. The female is similar to the male, but has the frontal plate smaller. The young, when fledged, have the upper part of the head of an olivaceous-brown, like the back and wings, the neck of a light dull grey, the chin dull white, the lower parts light grey, tinged with yellowish on the breast, most of the feathers tipped with whitish, the lines on the hypochondrial feathers of a dull cream colour and of small extent. The frontal plate is small, and with the bill of a dingy greenish colour, as are the feet, the claws yellowish-brown. On comparing together a great number of European and American specimens, I can find no specific differences. Individuals of either kind are larger or smaller, their frontal plates differ in size and somewhat in form, as do the bill and the claws; but if the species are really different, Nature has made them so wonderfully like each other, that there seems to me no possibility of distinguishing them. My friend Dr. NEILL has furnished me with the following anecdotes illustrative of the habits of this bird. "At Canonmills Loch, near Edinburgh, a pair (or sometimes two pairs) of Water-hens breed yearly, making their nest on the branches of some very large saughs (willow-trees, Salix russeliana) growing in my garden, and overhanging the pond. One season (four or five years ago) finding themselves persecuted by a tame Heron, which watched and devoured their first young brood (for we detected him in the act), they formed their nest more than fifteen feet high on the trunk of the willow-tree. There the eggs were hatched in safety, four or five young being in due time seen sailing about with the old birds. We had only one pair on the Loch last summer. How they descended to the water can only be conjectured: they might have crept downwards three or four feet, but they must at all events have fallen at once from a height of not less than twelve feet. When the pond is frozen over and covered with skaters, the Water-hens enter the garden and conceal themselves in an overgrown rock-work, subsisting on minced flesh mixed with bread or potatoes, purposely laid down for them, and on which I have often watched them feasting when the snow was lying deep."